A few tickets remain for this fabulous evening on Saturday 27th January at 7.00pm. Featuring ceremonial Haggis, neeps and tatties, delicious buffet, toasts to the lads & lassies and ceileidh dancing into the wee sma' hours! 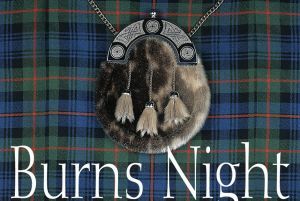 Dress code, highland dress, balck tie or equivalent. Tickets £15 (plus contribution to the buffet).